Some of Bailey Small Animal Teaching Hospital veterinary technicians who have earned advanced degrees in the profession. Veterinary technicians may be the unsung heroes of most any veterinary practice, stepping in and handling a multitude of workplace tasks, and doing so without most understanding their work or the experience and education required. Oct. 16-22 marks the 23rd National Veterinary Technician Week, and at the College of Veterinary Medicine, vet techs are valuable and necessary to our mission of animal healthcare and in the education of future veterinarians. 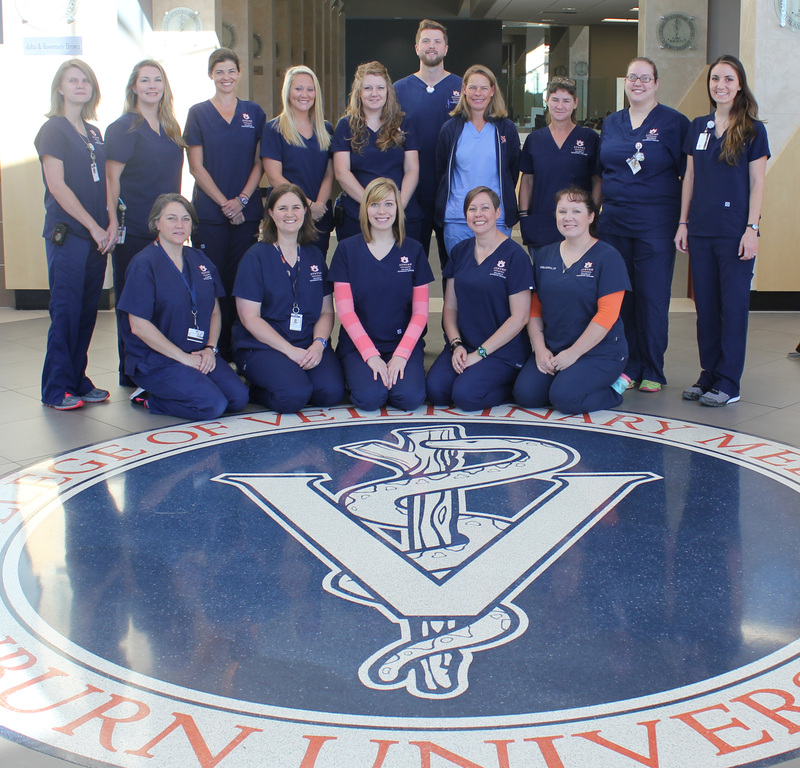 The faculty, staff and students of Auburn University College of Veterinary Medicine want to thank the veterinary technicians for their hard work and the role they play in making the college and teaching hospitals successful. “Our veterinary technicians help to ensure that each clinical service, and each patient, student, and house officer in the service has the best care for the patient, and a quality learning opportunity for our students, interns and residents,” said hospital director Dr. Doug Allen. A technician’s job can be multifaceted – assisting in the exam room, treatment areas, surgery, critical care and more. Their role is much like that of a nurse in human medicine, and the variety of their scope of work depends on the type of veterinary facility where they are employed. 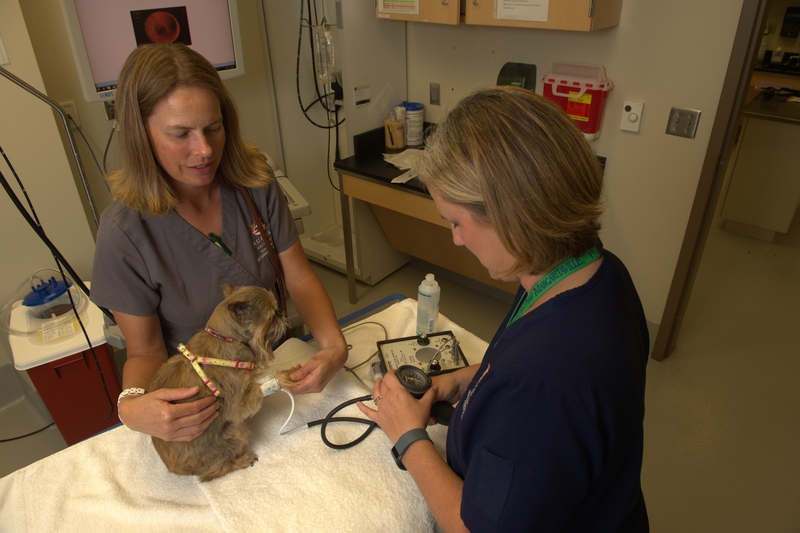 More than 70 Auburn veterinary technicians work in the Veterinary Teaching Hospital, to provide animal care, assist veterinarians and help keep the hospital functioning on a daily basis, and this week we recognize their hard work. The technicians serve as the veterinarian’s nurse, laboratory technician, radiography technician, anesthetist and surgical assistant, and their educational background is as varied as their experience. Internal Medicine Service technicians Janeva Cole, left, and Jennifer “JP” Pannell, right, perform a test on a pet. Hayley Pritchard, a veterinary technician for the Bailey Small Animal Teaching Hospital’s Surgery Service, believes education is the key to performing her job well. In addition to a bachelor’s degree in animal science, she has earned the AAS in veterinary technology and is certified at the state and national level. “People ask me if I will be going on to vet school but I chose a career as a veterinary technician,” Pritchard says. “I am passionate about the hands-on, involved, and individualized care that veterinary nursing provides. “I immerse myself in continuing education so that I can practice the gold standard of medical care,” and Pritchard is currently pursuing specialty certification in small animal surgery. Foltz was half-way through a master’s degree before she changed career goals. “I went back to school to earn an associate of applied technology degree in veterinary technology with the intention of becoming an ICU nurse and specializing in Emergency and Critical Care,” and in 2012, Foltz became one of only 350 members in the prestigious Academy of Veterinary Emergency and Critical Care Technicians. And while many of Auburn’s veterinary technicians have advanced degrees, others have taken a different path to their career. Courtney Burbage, who has worked in the Emergency and Critical Care Service for three years, has been a veterinary technician for nine years, and says the high stress of working in emergency, with similar experiences to that of a human hospital emergency, isn’t easy but is very rewarding. “Losing a patient is the most challenging. It never gets easier to watch someone lose a beloved family member that we have worked so hard to save. “I find great joy in working with critical patients that defy all odds and overcome sickness or trauma and are able to live happy, healthy lives,” Burbage added. Click for more information on National Veterinary Technician Week and the AVMA.